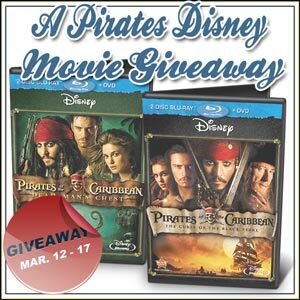 Pirates of the Caribbean DVD Giveaway! Arrr! Disney’s Pirates of the Caribbean is a trilogy of adventure that has millions clamoring for more of Johnny Depp’s irredeemable Captain Jack Sparrow. Kat’s Cafe and a few other raunchy … er … lovely bloggers have put together a pirate’s adventure of a movie giveaway just for you! Take your chances with other entrants in Disney’s Pirates of the Caribbean: The Curse of the Black Pearl and Pirates of the Caribbean: Dead Man’s Chest — a marvelous good time and fun for the whole family. From producer Jerry Bruckheimer (Pearl Harbor) comes Pirates of the Caribbean: The Curse of the Black Pearl, the thrilling, high-seas adventure with a mysterious twist. 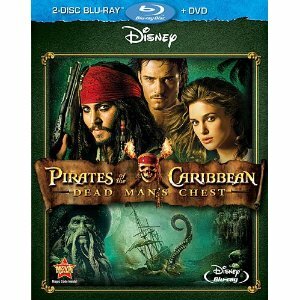 The roguish yet charming Captain Jack Sparrow’s (Johnny Depp) idyllic pirate life capsizes after his nemesis, the wily Captain Barbossa (Geoffrey Rush), steals his ship the Black Pearl, and later attacks the town of Port Royal, kidnapping the governor’s beautiful daughter Elizabeth (Keira Knightley). In a gallant attempt to rescue her and recapture the Black Pearl, Elizabeth’s childhood friend Will Turner (Orlando Bloom) joins forces with Jack. What Will doesn’t know is that a cursed treasure has doomed Barbossa and his crew to live forever as the undead. Rich in suspense-filled adventure, sword-clashing action, mystery, humor, unforgettable characters and never-before-seen special effects, Piratesis a must-have epic on the grandest scale ever. And now for the Rafflecopter – an adventurous battle of pure chance! I think Alice in Wonderland is my fav Johnny Depp movie. The Chocolate something movie with him is my all time favorite! Pirates of the Caribbean: The Curse of the Black Pearl is my favorite, but I enjoy watching Johnny Depp in almost anything. “The Curse of the Black Pearl”! I like the black pearl the best! I love these movies, but I find I like the move Sweney Todd more. I’m just a bigger fan of music, and loved that movie. Johnny Depp was wonderful as the Madd Hatter in Alice in Wonderland. I like pretty much everything he’s in. He’s a wonderful actor! My favorite is Curse of The Black Pearl. My husband liked benny & joon. My favorite is at Worlds End, love it! Dead Man’s Chest is my favorite. They are all really good. I Like Dead Man’s Chest The Best. My fave is Edward Scissorhands. My favorite Johhny Depp movie is Benny and June. The Black Pearl for me. Pirates of the Caribbean: The Curse of the Black Pearl,although I love anything with Johnny Depp:)Thanks so much for this opportunity! !